I’ve created an army! Only this army does not fight, they love, and you in return, love them back. It’s a mini cupcake army, and if you like peanut butter, you must stop what you are doing, throw on your apron, and grab your kitchen-aide. It’s time to go to work. Starting and ending with the dry mixture, alternate with the cocoa mixture and add to the batter until thoroughly mixed. Using a standing mixer, combine the powdered sugar, peanut butter, butter, vanilla, and salt until creamy. Scrape the sides of the bowl as you go. Add the milk and mix on a high speed until light and smooth. Frost cupcakes as desired. 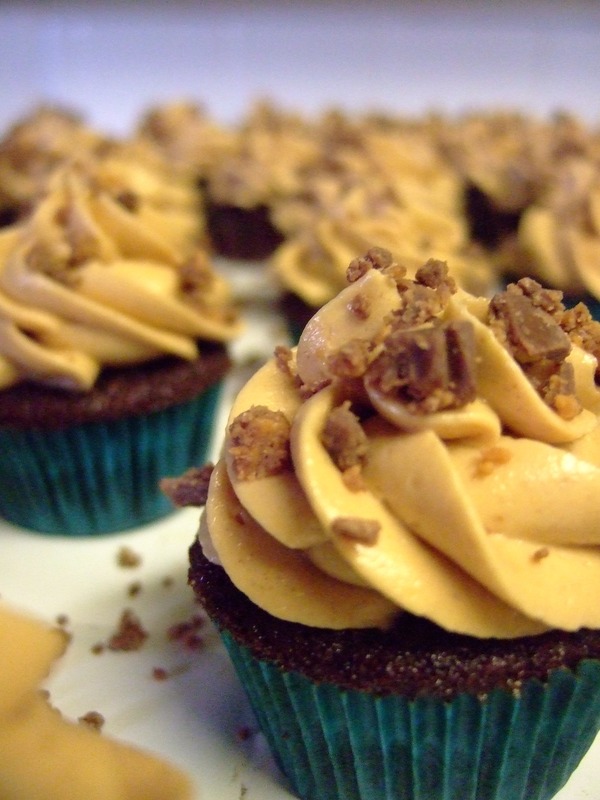 Finely chop the reese’s cup and sprinkle over tops of frosted cupcakes. These look so AMAZING!!! Can’t wait to try this recipe! These look decadent. I want one now!